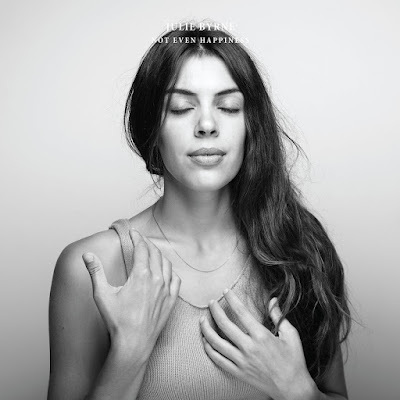 Julie Byrne's sophomore LP delivers an unforgettably powerful and affirming experience. “Discover real peace and happiness within yourself, and naturally this will overflow to benefit others.” - S.N. Goenka. Meditation begins with the awareness of physiological functions: breath, blood, tension, voice. Once someone can come to terms with those functions, they're able to move deeper, to examine the parts of their lives that live untouched, and finally to find an eternal and transcendental spirit experience. Or at least that’s what people say. Julie Byrne’s sophomore LP follows that journey from the j to the y, carrying its listeners through the processes of sensation as Byrne finds her voice. In doing such, the record gives Byrne’s audience an unforgettably powerful and affirming experience. If I were to choose a singular theme that ties together the emotional tidal wave that is Not Even Happiness, it would be balance. Balance rather than flourish, balance rather [even] than happiness. Every element for each track is equally important, finding the perfect space of not-too-little and not-too-much. As records go, this is one that lays on a balance beam between its two best songs showcasing two of its best environmental qualities. The first: an empty, echoing meditation; the last: an epic, atmosphere-shaking new age ballad. But in between, Byrne never shies from emotional confrontation. Instead she faces it with eyes looking inward towards a strength that is only found in the most fragile of artistic expressions. Julie Byrne first grabbed attention with an album of almost purely guitar songs, but it was the kind of guitar songs that want to defy the stereotypes of the “singer/songwriter” label. Oftentimes channeling the gentle genius of a record like Nick Drake’s Pink Moon or Grouper’s Cover The Windows and The Walls (with which the record shares a similar name), Rooms With Walls and Windows drew a portrait of a young artist full of sorrow but even more so full of bristling talent. Not Even Happiness, arriving almost three years later, shows that Byrne’s talent overflows even in the higher production of a studio record. There are lots of tugs towards calling Byrne’s music “ambient” despite its relatively constant usage of folk songwriting and guitar-based songs. Her record finds a space of little disturbance usually reserved for the ambient category. There are zero shocks, zero pops of disruption throughout its nine tracks, and much of that quality is owed to Byrne’s voice itself. Her lyrical delivery holds a spacious, buttery timbre with no friction, like smoothed mossy stones under flowing water. But this powerful connection to nature, coupled with Byrne’s production choices, makes the strongest argument that this album is, more than anything else, an effective new age album on meditation and self-searching. The sky, the woods, the anxiety of urbanization; these are the lyrical elements operating on the surface of Byrne’s acoustic ocean. But underneath are juxtaposing themes of solitude, romanticism, and an Earthly soul. All of these are topics that stand on a slippery slope to the campy and the corny, but Byrne takes her steps very purposefully and very delicately. Her work balances against that brink of cliche with intimate expressions of herself. “I’ve been sitting in the garden / I’ve been searching for an anchor / I have been seeking God within,” she sings at the end of “All The Land Glimmered Beneath.” The longer the record spins, the further Byrne moves away from pure acoustics and towards hypnotic new age production. And, surprisingly, this is where she shines the most. By the time a deep, heavy synth pattern starts off the final song, Byrne is channeling an artist like Enya or latter-day Kate Bush at their very, very best. Perhaps it would be easy to not think about the record’s cover at first glance; after all it’s a simple photo of the artist herself. But in retrospect on her musings that embolden the record, her closed eyes and gentle touches to her own skin portray more than just a portrait. Rather, the cover gives an immediate snapshot to the record’s headspace of inner seeking, and her hands beckon the listener just like the very first stanza commands: “Follow my voice.” Not Even Happiness takes the mission of a guided meditation, but it isn’t one. Instead, it’s a shared experience of finding silence in yourself when the surrounding world is in chaos. What record could be more perfect for the beginning of 2017? Listen to Julie Byrne on bandcamp.